1. I think my cupcake skills are getting exponentially better. I love that they look pretty now instead of my usual “A for effort” looking cupcakes, but this doesn’t bode well for the “gotta eat healthier” mode I’ve been working in. At least bringing them into work gets me to only eat one instead of all of them. It’s just the mound of leftover frosting living in my fridge that’s ruining my day, spoonful by spoonful. Also, if you’re interested in a killer chocolate cupcake recipe, I’m in love with Jessica’s blog “How Sweet It Is”. Her Chocolate Lover’s Cupcakes are awesome. I will confess, though, that I made quite a few alterations, though, as my pantry was severely lacking this week. 2. Twitter. Love it? Hate it? I mostly started one so I could learn more about companies I’m applying at. For that purpose, I’ll admit, it’s actually a great tool. I do, however, find it pretty difficult to discern people’s personal thoughts from those they are copying from others. Bring about that debate about whether or not there are original thoughts anymore. I’m just gonna believe it’s not true and move one. 3. Water and workouts. Those are my new loves this week. Hopefully that will continue into next week to show some actual results. 4. 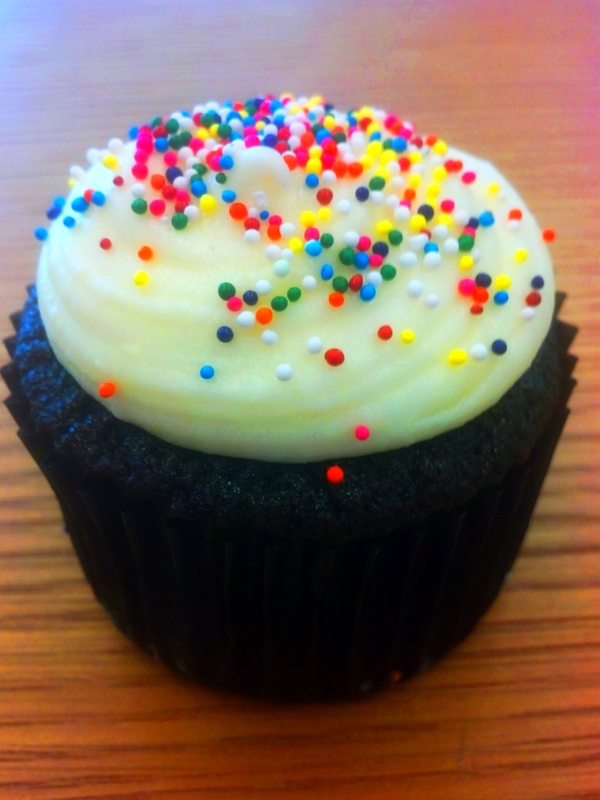 I still can’t get over how ironic it is to be posting about healthy stuff with a picture of a cupcake above. Sigh. I am weak.